Representatives of twelve colonies assembled in Philadelphia in September 1774 at Carpenters’ Hall, then and since the meeting hall for the Carpenters’ Company of the City and County of Philadelphia. At the conclusion of the Seven Years’ War in 1763, independence from the British Crown was an outlandish thought in the minds of many American colonists. They enjoyed the protections of one of the world’s most powerful empires and rights and freedoms granted to its subjects. Little more than a decade later, delegates from these same colonies assembled in Philadelphia, risking their “lives, fortunes, and sacred honor” as they declared independence from Great Britain. The First and Second Continental Congresses, held in Philadelphia in 1774 and 1775-81, engaged in the complex politics surrounding independence and heightened the city’s role in a world-changing moment in history. Tensions between the British Crown and the American colonies had simmered since the passage of the Stamp Act in 1765. The Coercive Acts, passed by the British Parliament in 1774 to punish the city of Boston for the Boston Tea Party, put the Massachusetts government under direct British control, closed the port of Boston, and increased British troops there. While the Acts were designed to bring only the Massachusetts colony under tight control, the highly punitive legislation drew concern from all thirteen colonies. Many outside of Massachusetts viewed the acts as a violation of their valued rights under the English constitution; the outrage demanded a unified response from the colonies. But what response? Only the most radical among the colonists advocated for independence. Many others, including Pennsylvania political leaders John Dickinson (1732-1808) and Joseph Galloway (1731-1803), acknowledged the need for political unity but also encouraged caution, non-violent action, and a desire to reconcile their differences with the British government. Representatives of twelve colonies assembled in Philadelphia in September 1774 at Carpenters’ Hall, then and since the meeting hall for the Carpenters’ Company of the City and County of Philadelphia. (Georgia, in dire need of the services of British regulars to fend off incursions of Creek Indians on its borders, did not send a delegation.) 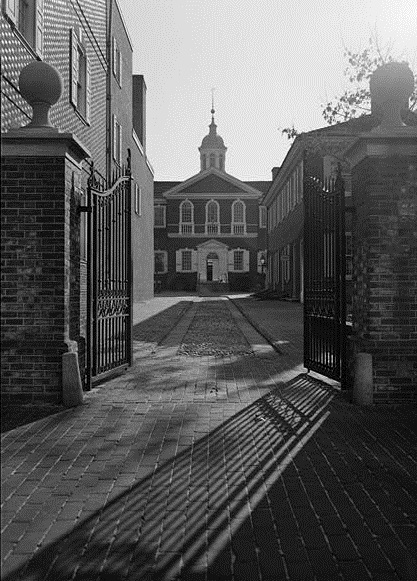 The choice of Carpenters’ Hall, rather than the Pennsylvania State House, reflected the complex politics surrounding the independence movement. The State House was the seat of the Pennsylvania Provincial Assembly, which in the fall of 1774 was not only against independence but was viewed by many in Philadelphia as highly sympathetic to the British Crown. Galloway had served as Speaker of the Assembly since 1766, and he was clear in his belief that the colonies needed to reconcile their differences with Britain (later, in 1788, he moved to England). 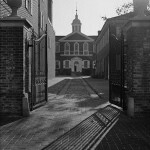 Carpenters’ Hall also housed the collections of the Library Company of Philadelphia, established in 1731 by Pennsylvania delegate Benjamin Franklin (1706-1790), of which the delegates were made subscribing members. Then the largest port city in the colonies, Philadelphia was well situated to play a critical role in the slow march to independence. Its strategic location, wealth, population, industrial and commercial capacity, and professional and business classes were unsurpassed in America. On a more practical level, the city’s public buildings—including the State House, the “British Barracks” in Northern Liberties, the Pennsylvania Hospital, and Walnut Street Prison—could accommodate any of the needs of both Congresses. Philadelphia also contained more than enough diversions to entertain its distinguished visitors. Massachusetts’ John Adams (1735-1826) and Connecticut’s Silas Deane (1737-1789) both noted the nearly unparalleled luxury found in the Second Street home of John Cadwalader (1742-1786), with whom they both dined. Delegates also were entertained in the many exclusive clubs of Philadelphia’s elite, including the Schuylkill Fishing Company, which was founded in 1732 and still exists as State on Schuylkill, one of the oldest private clubs in the United States. 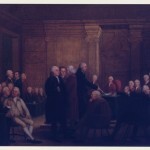 At the First Continental Congress, little consensus existed as whether to declare independence. When Galloway proposed a “plan of union” with Great Britain, the delegates voted it down, but narrowly. 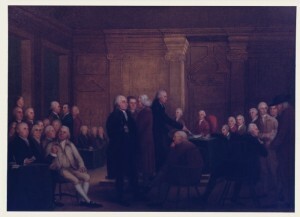 After seven weeks of debate, the first Congress ended with the delegates agreeing only to form an “Association” to boycott British goods and to meet again in May 1775. By the time the Second Continental Congress assembled, this time in the Pennsylvania State House (later Independence Hall), events had moved forward rapidly. The delegates were not dealing solely with philosophical and political questions related to their rights as Englishmen, but were responding to the hostilities that began between British regulars and Massachusetts militiamen at the Battle of Lexington and Concord on April 19, 1775. This Congress, now joined by Franklin and Thomas Jefferson (1743-1826) and presided over by John Hancock (1737-1793), appointed George Washington (1732-1799) as commander of the Continental forces, managed the loosely organized colonial war effort, and debated whether to declare independence. Initially, many of the delegates favored Dickinson’s long-held position—reconciliation with Great Britain. Jefferson, later the primary author of the Declaration of Independence, also wrote the first version of the Olive Branch Petition, which in July 1775 affirmed the colonists’ loyalty to the British king in an attempt to avoid further bloodshed. When the petition was rejected by King George III (1738-1820), who viewed the Second Congress as an illegal assembly and insincere in its intentions, members of the Congress who favored independence saw their opportunity and pushed for independence. After formally declaring independence on July 2, 1776, the Second Continental Congress became the government of the United States, and Philadelphia became the nation’s capital city. This location did not last long as the British army took control of Philadelphia in the fall of 1777, forcing the Congress to flee and conduct its business from a variety of locations, including York, Pennsylvania; Princeton, New Jersey; Baltimore, Maryland; and New York City. When the British army left Philadelphia after nine months of occupation, the national government returned its capital to Philadelphia, where it remained until 1781. Regardless of its location, the weak powers of this first national government nearly caused its failure. To fight the American Revolution, the thirteen American colonies cautiously entered the “firm league of friendship” established by the Articles of Confederation. Indicating its weakness as a frame of a unified national government, the document was not fully ratified by all of the colonies until 1781—four years after its initial creation in 1777. Fighting the war with borrowed money and little power to collect revenue from the states through taxes, the Continental Congress was bankrupt at the conclusion of the War for Independence. When the states, addressing this and other problems facing the new nation, ratified a new United States Constitution in September 1788, the Continental Congress began its slow fade into history. The end came on March 2, 1789, in New York when the Congress was adjourned by its lone member, New York’s Philip Pell (1753-1811), for the last time. Hogeland, William. Declaration: The Nine Tumultuous Weeks When America Became Independent, May 1-July 4, 1776. New York: Simon and Schuster, 2010. Rakove, Jack N. The Beginnings of National Politics: An Interpretive History of the Continental Congress. New York: Alfred A. Knopf, 1979. Papers of Joseph Galloway in Philadelphia and other repositories (Biographical Directory of the United States Congress).